Cohort analytics can be defined as groups of users with similar characteristics over time and can be a great indicator for product effectiveness and user engagement. Thomas Tunguz from Redpoint has written some great blog posts on cohort analytics and how to interpret them effectively. Cohort Analysis can be notoriously difficult to perform within the database. 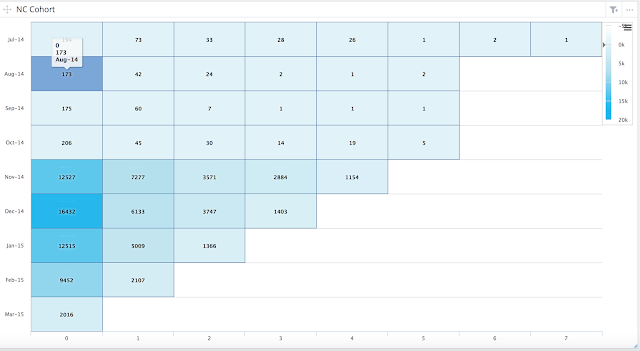 In this blog post, we’ll take a step-by-step guide to generating cohort analysis using Cloud9 Charts to go from raw data to the following cohort heatmap grid in a few easy steps. Our objective here to determine the monthly transactions cohorts based on the signup month. Calculating cohorts is as simple as applying the Cloud9QL below. In case you are unfamiliar, Cloud9QL is a post processor with SQL-like familiarity that be used for analytics post processing on your data on top of your database queries. Last Step: Change the visualization type to a heat map grid. In a few simple steps, we've obtained a visual cohort grouping of your data. If you need help with determining cohorts for your own data, please feel free to contact us.